I Have No Intention To Let My Natural Hair Grow Long. Here's Why. I Have No Intention To Let My Natural Hair Grow Long. Here’s Why. If you’ve been rocking with me all along, then you should know that I’ve been team #shorthairdontcare since 2010. But the first time I cut off my hair was in 2003. I was turning 21. I had a one year old son, but a very young face. So I wanted a hairstyle to make me look grown. I decided on the Halle Berry Cut. That’s what we called the Pixie Cut back then since it was her signature style. No one thought I would go through with it because my hair had grown out so long. But I did. And I fell in love immediately. I felt more confident. I changed up my style and started to dress more funky. This was my look. I wore my hair short until about 2005 when I decided to grow it out and play with more styles. I tried all types of weaves. But my signature look was a long ponytail with either chinese cut, or side swept bangs. I even attempted to transition to natural in 2010. But my hair kept breaking off at the demarcation line. So I quit. That’s when I decided to cut all of my hair off again into a Pixie Cut. I fell in love with short hair all over again and never looked back. Not until I decided to do the Big Chop and wear my natural hair. It took a little while to get used to rocking my natural texture. But my new Tapered Cut was so me. It fit my face. It fit my style. And it fit my lifestyle. Just like my relaxed Pixie Cut. My original plan was to let my natural hair grow long though. 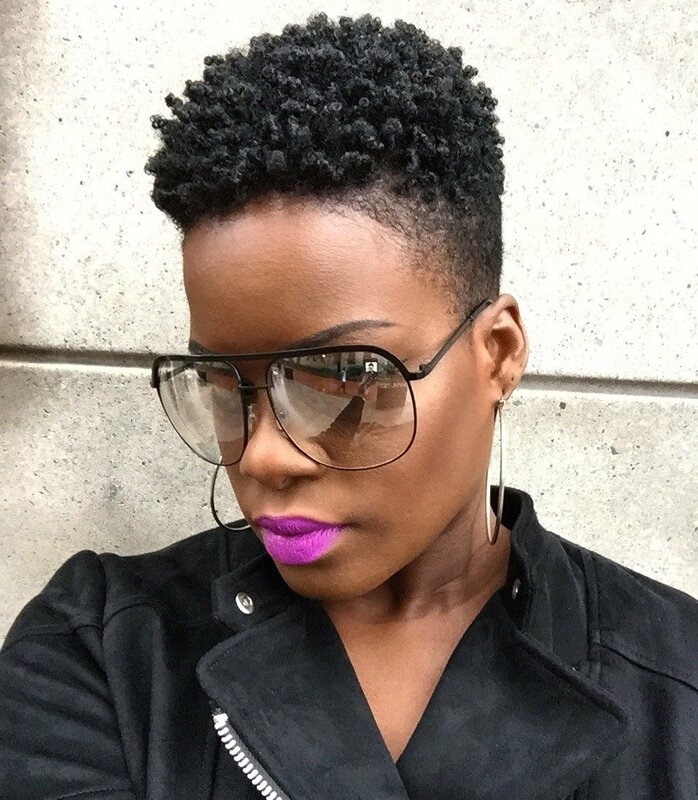 I did the Big Chop because I knew my hair didn’t do well with transitioning. But I intended to let my ‘fro grow big and full. Until it did. And my first reaction was to cut it off because it was getting too long. So I did. And I’ve been repeating this process every time it grows out. I keep telling myself that I’m going to let it grow this time. Then I cut it off again. I’ve come to the realization that I don’t like long hair. My hair was pretty short as a child. My Mom relaxed my hair when I was 9 but didn’t know how to take care of it. So it was constantly falling out. I always wished that I had long hair. And I eventually did. In high school my hair grew really long when I used to go to the Dominican Salon to get my relaxer and wraps. And I took really good care of my hair at home in between appointments. I let it grow to almost bra strap. Then cut it into a Bob with bangs when I got to college. After letting it grow out again, I then cut it off into my first Pixie. I realized that I was only obsessed with having long hair because I didn’t have it. When I did get it, I realized it wasn’t that important to me. I love short hair. Short hair fits my face. I feel so confident and beautiful. It fits my style. Funky. Edgy. Yet Chic. It fits my lifestyle. I always have a million and one things to do and don’t have a lot of time to spend on my hair. Especially now that I’m taking hair clients again. Although my hair is short, it’s super thick and requires a lot of work to style. My arms and back be killing me after. I’m not about that life. And to be frank, I don’t want to be about that life. I love my short hair. I love my Tapered Cut. And that is why I have no intention to let my natural hair grow long. Long hair is not my look. I may experiment here and there, but I always come back to where my heart is. Now I try not to say never, as I never thought I would wear my natural hair. But look where I am now. I love your glasses. Where did you get them from please? You are very welcome. I’m currently doing a growth challenge until the end of the year to start my journey of letting my top grow out longer. I already want to cut it all off!